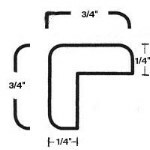 Door and Drawer Specifications: Standard 1/2" Overlay Door and Drawer Headers. Drawer Box: Hardwood Plywood 5/8" Dovetailed Drawer Box With 1/4" Plywood Bottom. 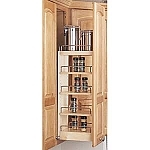 Hinges: Soft Close Concealed, 110 Degrees 6-Way Adjustable Hinges. 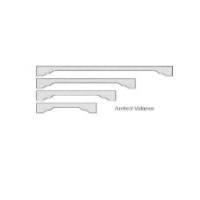 Drawer Glides: Full Extension Under - Mount Soft Close Drawer Glides. Box Material: 1/2" Cabinet Grade Plywood. Front: 1 1/2Ã¢â‚¬Â Solid Hardwood Face Frames, Dadoed To Receive 1/2Ã¢â‚¬Â Plywood Case Sides, Tops, and Bottoms. 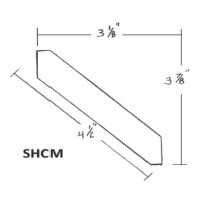 Shelving: 3/4Ã¢â‚¬Â Natural Wood Veneer Finished Engineered Wood Shelves, Edgebanded On Visible Edges. Exterior: Pre-Finished Side Panels To Match The Cabinet Front. Interior: Sealed Natural Finished Wood Interiors, We Do Not Use Paper or Plastic Veneers For Our Cabinet Interiors. Construction: I-Beam Construction Using The Pin and Glue Method For The Cabinet Plywood Box And Face Frame. 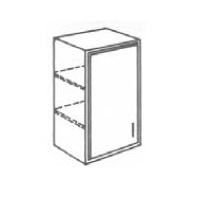 This method is used by all custom cabinet makers to ensure the highest quality cabinet construction available. 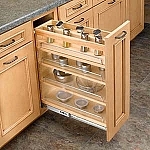 REV-A-SHELF 6" BASE FILLER PULL OUT SPICE RACK 6"W X 23"D X 30"H.
BAT - RTA Newtown Premier Chestnut Batten Molding 3/4" x 96"
BML - RTA Newtown Premier Chestnut Base Molding 6" x 96"
CFM - RTA Newtown Premier Chestnut Cabinet Face Molding/Light Rail 3/4"T x 1.5"W x 96"
OC - RTA Newtown Premier Chestnut Outside Corner Molding 3/4" x 3/4" x 96"
QR - RTA Newtown Premier Chestnut Quarter Round 3/4" x 3/4" x 96"
Replacement Soft Close Drawer Slides 18"
Replacement Soft Close Drawer Slides 21"
SC - RTA Newtown Premier Chestnut Scribe Molding 3/4" x 96"
Straight Molding 6" x 96"
REV-A-SHELF 3" BASE FILLER 3"W X 23"D X 30"H.
TK96 - RTA Newtown Premier Chestnut Toe Kick 4.5" x 96"
Under Sink Wire Basket 11"
Under Sink Wire Basket 14"
Under Sink Wire Multi Use Basket 14"